Dinner and cocktails on the patio at Milk & Honey in Northeast Harbor. An opportunity for local drag kings and queens to get gussied up for a night on the town. All amateurs welcome! Karaoke hosted by the fabulous Geo Neptune! Location: Little A's, 131 Cottage St.
An evening of performance - theatre, comedy, spoken word, music, and movement, open-mic-style. Location: YWCA, 36 Mt. Desert St. 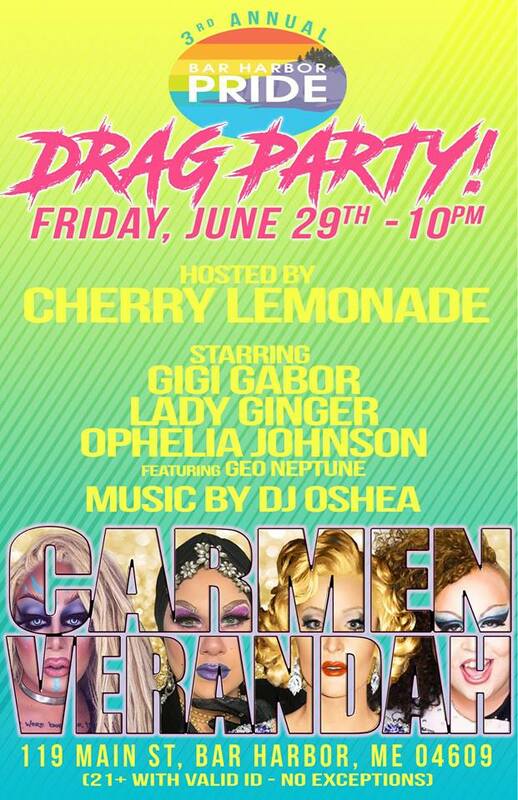 Drag Show featuring Cherry Lemonade, Lady Ginger, Gigi Gabor, Lady Johnson, and a guest appearance by our local Fabanaki Diva Geo Neptune. Location: Carmen Verandah, 119 Main St. Summit Cadillac Mtn. via the Gorge Trail. Meet at the Village Green to take the Island Explorer. Bring water and hiking shoes! Dogs welcome! Intermediate level hiking. $6/ticket. 90 mins. Join us afterwards for a post-film mingle and discussion. Location: The Criterion Theatre, 35 Cottage St. Location: Lompoc Cafe, 36 Rodick St.
Brunch provided by Sassafrass Catering and Morning Glory. Suggested donation of $15/plate. Meet at the Village Green to take the Island Explorer to Sand Beach. Swimwear, sunscreen, and water recommended!